EMPLOYMENT OPPORTUNITIES - Click Here to apply online! Our newest location opened in September of 2012 in Columbia, MO. 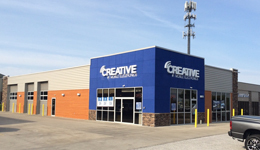 4950 Square foot building that showcases the latest technology in retail car audio. The most current show room displays and the sound room features 20 different amplifiers, 32 pairs of speakers, and over 24 subwoofers. Also showcases bass nuts in our subwoofer room where you can listen to 10 - 12" subs at the same time. Click here to find out more about Creative Window Tinting. Started at our Pittsburg, KS location and through the years has also worked at our Joplin store before becoming the regional manager for our Sedalia, Springfield and Columbia locations.